Learn about your horse’s teeth and what makes them uniquely suited to the fibrous equine diet. Equine teeth are perfectly designed to process tough roughage. 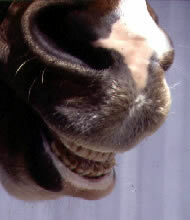 A flip of your horse’s lips gives you only a glimpse of the grass-nipping incisors at the front of the horse’s mouth. You can’t see the real dental workhorses, the molars that grind the fibrous roughage and hard grain kernels. Along with those 12 incisors–six up and six down–the adult horse has double that number of cheek teeth, as the 12 premolars and 12 molars are called. Thus, all normal mature horse mouths contain at least 36 teeth, but the count can rise to 44. Male horses usually have four canine teeth, one in each bar–the toothless span between the incisors and premolars–and some mares also produce a pair of canine teeth. Up to four “wolf” teeth may also appear in the bars of both sexes. Named for their pointed shape, these tiny, nearly rootless vestiges of an ancient premolar are nonfunctional holdovers from the species’ prehistory. Equine teeth are built much tougher than ours because of dietary necessity. Dentin, a bonelike substance but harder still, comprises approximately half of the tooth, giving it its structural rigidity. Enamel, a rock-hard material able to grind anything edible, runs in veins through the dentin. Dentin and cementum wear a little more readily than enamel, continually exposing the enamel ridges in the chewing surface needed to process abrasive, tough roughage. Completely formed at an early age, equine teeth erupt throughout the animal’s lifetime as the grinding surface slowly wears away. In a young adult horse, about one-quarter inch of a 4 1/2- to five-inch tooth is visible beyond the gum line, with the rest of the tooth stored in the dental socket. In a 5-year-old with his recently completed set of permanent teeth, the roots of the upper back molars reach almost to the eye socket. Equine teeth wear and erupt at a rate of about one-eighth of an inch annually, meaning that aging horses may run out of chewing equipment toward the end of their third decade of life.